Look up, its potentially dangerous. There is an asteroid as big as the Rock of Gibraltar is about to zip past Earth on April 19 at a relatively safe but dangerously close distance, according to astronomers. According to NASA: “Although there is no possibility for the asteroid to collide with our planet, this will be a very close approach for an asteroid this size,” Called 2014-JO25 and approximately 1.5 km across, it will come within 1.8 million kilometers (1.1 million miles) of Earth. This distance is less than five times the distance to the Moon. It will pass closest to Earth after having circled around the Sun. 2014-J25’s will then stay on path towards Jupiter before heading back toward the center of our Solar System. The next close encounter with a big rock will not happen before 2027, when the 1.5 km wide asteroid 199-AN10 will fly by at just one lunar distance, about 380,000 km (236,000 miles). The last time 2014-JO25 was in our close neighborhood was 400 years ago, and its next encounter with Earth won’t happen until sometime after 2600. The April 19 flyby is an “outstanding opportunity” for astronomers and amateur stargazers, NASA said. Given its incredible size, the asteroid has been nicknamed “The Rock” in honor of entertainer and all around good guy, Dwayne Johnson. “Astronomers plan to observe it with telescopes around the world to learn as much about it as possible,” the US space agency noted. Besides its size and trajectory, scientists also know that its surface is twice as reflective as that of the Moon. It should be visible with a small optical telescope for one or two nights before moving out of range. 2014-J25 was discovered in May 2014 by astronomers at the Catalina Sky Survey near Tucson, Arizona. Also on April 19, a comet known as PanSTARRS will make its closest approach to Earth at a “very safe” distance of 175 million km (109 million miles), according to NASA. Slooh astronomers will be tracking the asteroid and submitting data to the Minor Planet Center in order to better understand its physical properties. During the live show, Slooh host, Gerard Monteux, will be joined by J. L. Galache, founder of Aten Engineering, as well as Slooh astronomers Paul Cox and Bob Berman. They’ll come together to discuss the asteroid, its discovery, and how we might stop an asteroid of this size should one be discovered on a collision course with Earth. Slooh will cover the asteroid from its flagship observatory at the Institute of Astrophysics of the Canary Islands, one of the finest observatory sites in the world. Slooh routinely tracks potentially hazardous objects for the general public to view live (both asteroids and comets) whose sizes are large enough, and whose orbits take them near enough to our planet, that they have the potential to cause significant damage in the event of an impact. 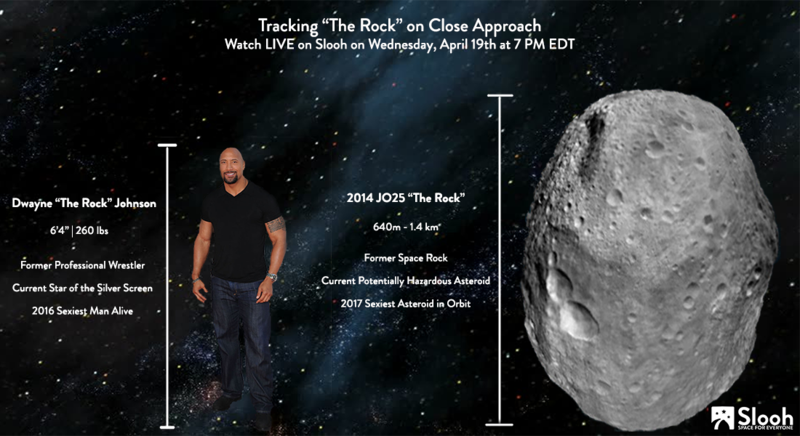 Slooh’s live asteroid shows have attracted millions of viewers, and Slooh has become a leading voice to help ensure that public awareness does not wane.